Description: Moses is an old time gun enthusiast from back in the day. He’s in his late fifties and has enough guns to outfit a small army. He especially likes antique firearms, the more complicated, the better. 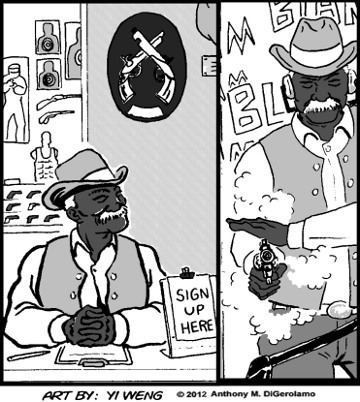 Moses ran a successful chain of gun shops, but sold them to retire to Arizona. He’s like an old cowboy when he talks. Moses wears a cowboy hat and kind of dresses like the Marlboro Man: Flannel shirt, jeans, cowboy boots, etc.